Reversible pulpitis: pulpal inflammation which should resolve once the etiology is removed (defective restorations or caries). Irreversible pulpitis: pulpal inflammation which will not resolve once the etiology is removed. Obtain thorough dental history and inquire about recent restorations or trauma. Inquire about previous history of pain on the offending tooth. What causes the pain and what relieves it? Perform an intraoral examination to check for exposed dentin, caries, a deep or defective restoration, or trauma. Perform a percussion test to rule out acute apical periodontitis. Perform a cold test using a refrigerant spray (e.g., Endo-Ice®) or an ice stick. Test the healthy control teeth first in order to better localize the offending tooth. Perform a hot test using hot water in a syringe (e.g., Monojet®) and rubber dam isolation, a heated gutta percha stick or heat source (e.g., System B™ Heat Source) to reproduce pain to hot. Healthy control teeth should be tested first. 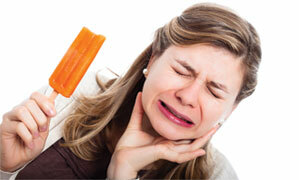 Delayed and prolonged pain triggered by heat may indicate irreversible pulpitis. Use radiographs to identify teeth with large restorations or caries that are not clinically visible. Keep in mind that teeth with reversible or irreversible pulpitis will not show periapical lesions radiographically, but may show thickening of the periodontal ligament (PDL), loss of lamina dura, and/or condensing osteitis. Irreversible pulpitis may show widened PDL space. Based on clinical examination and testing, a diagnosis of reversible or irreversible pulpitis is determined. Remove the irritant or repair tooth structure (caries, exposed dentin, defective restoration). Continue to monitor the patient’s symptoms. Advise patient to return if symptoms persist or worsen. Pulpectomy of the offending tooth: complete removal of the pulp. If it is determined that the case in question is too complex, promptly refer to an endodontist. If treatment is undertaken and the appointed treatment time permits, root canal treatment can be completed in one visit. Antibiotics are not recommended for irreversible pulpitis as they will not alleviate the patient’s pain and should not be given in lieu of performing an immediate pulpectomy. The patient may take an anti-inflammatory such as ibuprofen (600 mg q. 6 h. to a maximum of 2400 mg/day). This may be supplemented with scheduled dosing of acetaminophen (e.g., Extra Strength TYLENOL® [500 mg q. 4–6 h. to a maximum of 3000 mg/day]). Dr. Dabuleanu is an endodontist based in North York, Ontario. Hargeaves KM, Cohen S. Pathways of the pulp. 10th ed. St. Louis (Mo. ): Mosby Elsevier; 2011. Ruddle CJ. Endodontic diagnosis. Dent Today. 2002;21(10):90-2, 94, 96-101.